Rabbit polyclonal Fibrinogen antibody. Validated in ELISA, IHC, FuncS, ICC/IF, sELISA and tested in Mouse, Rabbit, Human. Cited in 16 publication(s). Independently reviewed in 3 review(s). Purified fibrinogen from human plasma. Our Abpromise guarantee covers the use of ab34269 in the following tested applications. Functional Studies Use at an assay dependent concentration. This antibody has been tested in plasma clotting assays. The plasma clotting time was prolonged (but not completely neutralized) by the antibody. Testing has indicated that these neutralisation assays work only when this antibody has been protein A column purified first. For sandwich ELISA, use this antibody as Detection at 1/200 dilution with Mouse monoclonal [1F7] to Fibrinopeptide A (ab14790) as Capture. Ab34269 staining human liver. Staining is localized to the cytoplasm. Left panel: with primary antibody at 1/50. Right panel: isotype control. Sections were stained using an automated system (Dako PT Link), at room temperature. Sections were rehydrated and antigen retrieved with the Dako 3-in-1 antigen retrieval buffer, citrate pH 6.0. Slides were peroxidase blocked in 3% H2O2 in methanol for 10 minutes. They were then blocked with Dako Protein block for 10 minutes (containing casein 0.25% in PBS) then incubated with primary antibody for 20 minutes and detected with Dako Envision Flex amplification kit for 30 minutes. Colorimetric detection was completed with diaminobenzidine for 5 minutes. Slides were counterstained with Haematoxylin and coverslipped under DePeX. Please note that for manual staining we recommend to optimize the primary antibody concentration and incubation time (overnight incubation), and amplification may be required. Standard Curve for Fibrinogen (Analyte: Fibrinogen protein (Human) (ab84410)); dilution range 1pg/ml to 1µg/ml using Capture Antibody Mouse monoclonal [1F7] to Fibrinopeptide A (ab14790) at 5µg/ml and Detector Antibody Rabbit polyclonal to Fibrinogen (ab34269) at 1/2000. 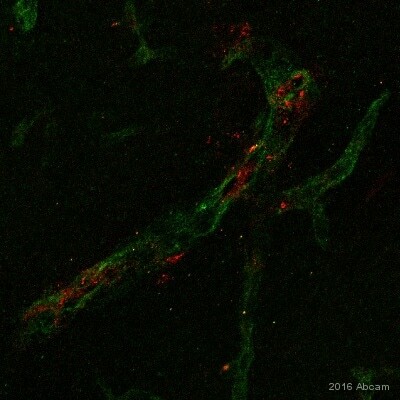 Immunohistochemistry (Formalin/PFA-fixed paraffin-embedded sections) - Anti-Fibrinogen antibody (ab34269)This image is courtesy of an anonymous Abreview. 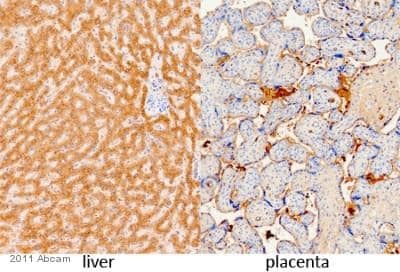 ab34269 staining Fibrinogen in Human liver/placenta tissue by Immunohistochemistry (Formalin/PFA-fixed paraffin-embedded tissue sections). The sections were fixed in formaldehyde and subjected to heat-mediated antigen retrieval in citrate buffer, pH 6.0 for 20 minutes at 100°C. The primary antibody was diluted 1/2000 and incubated with the sample for 20 minutes at 25°C. An HRP polymer-conjugated mouse anti-rabbit polyclonal IgG was used as the secondary antibody. 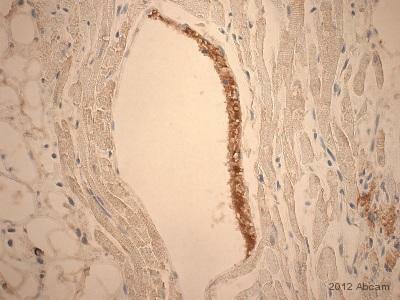 Immunohistochemical analysis of rat heart, staining Fibrinogen with ab34269. Tissue was fixed with formaldehyde and blocked with 0.25% BSA for 15 minutes at room temperature; antigen retrieval was by heat mediation in citrate buffer. Samples were incubated with primary antibody (1.5 µg/ml in 1% BSA in TBS) for 20 minutes. An undiluted HRP-conjugated goat anti-rabbit polyclonal IgG was used as the secondary antibody. Publishing research using ab34269? Please let us know so that we can cite the reference in this datasheet.